To start with you need to consider how much you wish to spend, if you only have an old rusty boneshaker then a premium top of the range metal cycle store is probably not a consideration, however if you have just purchased an expensive new mountain bike, hybrid or racer then secure storage is a priority, especially over the winter months when you may not be using your bike as often. Storage in the house is usually not viable as access can be a problem and the bike will need to be clean and dry before leaving in inside, puddles of water and splats of mud or oil on the carpet will not make you popular with other members of the family or residents. A garage can be a good option, but you will also need some secondary security inside such as a ground anchor or heavy duty metal bracket bolted into the floor or wall with which you can secure your bike to with a chain or security cable. However, when placed in a busy garage the bicycle can be prone to damage with people moving items past it, especially if you have children or you also use the garage to store your car. The next alternative is the garden shed, like the garage you will need additional security inside especially if the shed is made of wood or plastic as they do not offer good protection against a determined thief. Metal sheds are recommended due to the high level of security, these are also fire resistant and practically maintenance free; always opt for no windows when purchasing a new shed for cycle storage as thieves will not be able to see what is inside. Also as with the garage option you will need to be very careful when storing or retrieving other items in close proximity to your cycle, you will not be impressed if the lawnmower or barbecue gets intermingled with your new road bike. If storing multiple bikes you should consider placing racks or hooks within the shed or garage to maximise your storage space, specialist metal brackets are also available for attaching your bikes to a wall. 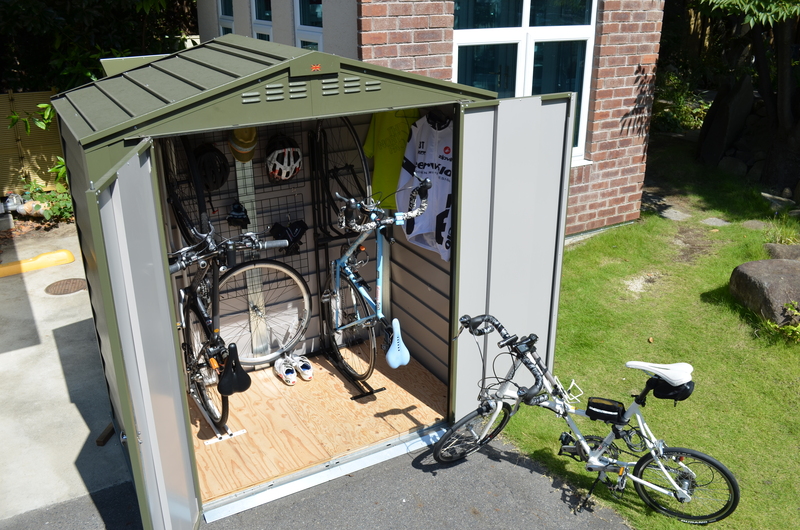 But what if you do not have room for a full size shed or you wish to keep your precious bicycle in an area where it is both secure from thieves and not prone to accidental damage. Well, there is a good selection of purpose built cycle stores available, from extremely cheap plastic stores to premium “Police Approved” metal versions. Our advice is to purchase the product relative to the value of your bike, so for example if you have spent £1500+ on a new road bike then £500 – £600 for a secure store is realistic, also consider that most bespoke stores can house multiple bikes. It should be mentioned that most insurance companies recognise products that have been approved by the Loss Prevention Certification Board (LPCB) and Secured by Design (SBD) as they offer proven and tested resistance to thieves – always look for products that meet this criteria when purchasing a store for an expensive and valuable bike(s).